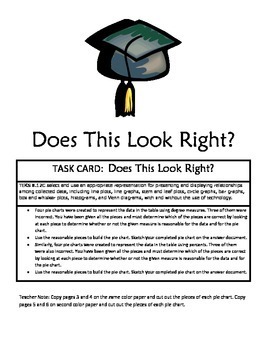 TASK CARD: Does This Look Right? TEKS 8.12C select and use an appropriate representation for presenting and displaying relationships among collected data, including line plots, line graphs, stem and leaf plots, circle graphs, bar graphs, box and whisker plots, histograms, and Venn diagrams, with and without the use of technology. 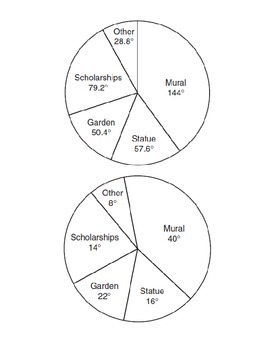 •	Four pie charts were created to represent the data in the table using degree measures. Three of them were incorrect. You have been given all the pieces and must determine which of the pieces are correct by looking at each piece to determine whether or not the given measure is reasonable for the data and for the pie chart. •	Use the reasonable pieces to build the pie chart. Sketch your completed pie chart on the answer document. 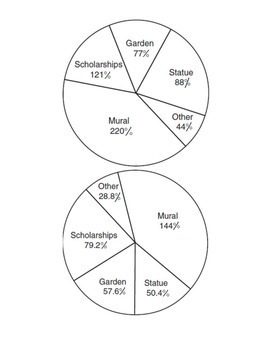 •	Similarly, four pie charts were created to represent the data in the table using percents. Three of them were also incorrect. 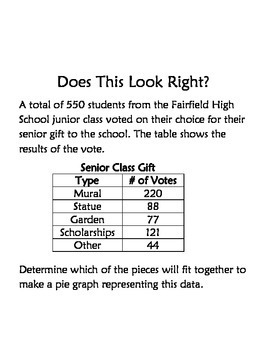 You have been given all the pieces and must determine which of the pieces are correct by looking at each piece to determine whether or not the given measure is reasonable for the data and for the pie chart.